Police Dept. Starts Pulling Pit Bulls From Shelters To Do THIS...Holy Moly! Animals Police Dept. Starts Pulling Pit Bulls From Shelters To Do THIS…Holy Moly! Police Dept. Starts Pulling Pit Bulls From Shelters To Do THIS…Holy Moly! Pit Bulls have such a bad reputation that some communities and cities (like Montreal) are banning their breed all together. Protect Pit Bulls from BSL online (BSL stands for Breed Selection Legislation) is working to stop the ban and change the way people think about Pit Bulls. Police departments like the Chattahoochee Hills, Georgia Police Department, and the Poughkeepsie Police Department in New York are helping in a big way. Instead of spending $10,000 to $15,000 on pure breed German Shepherds or Belgian Malinois, they are going to their local shelters and finding abandoned Pit Bulls. Without their intervention, these dogs would have been euthanized. Police departments all over the country are now working with programs like Animal Farm Foundation, Austin Pets Alive! and Universal K9 to train Pit Bulls to be official police canines. They are finding that rescued Pit Bulls can be obedient and hard-working police and military assets. They can learn everything from narcotics, explosives, cadaver and arson detection and criminal apprehension. If this trend continues, Pit Bulls may no longer be the villains of the dog world but a great help in catching villains in the real world! 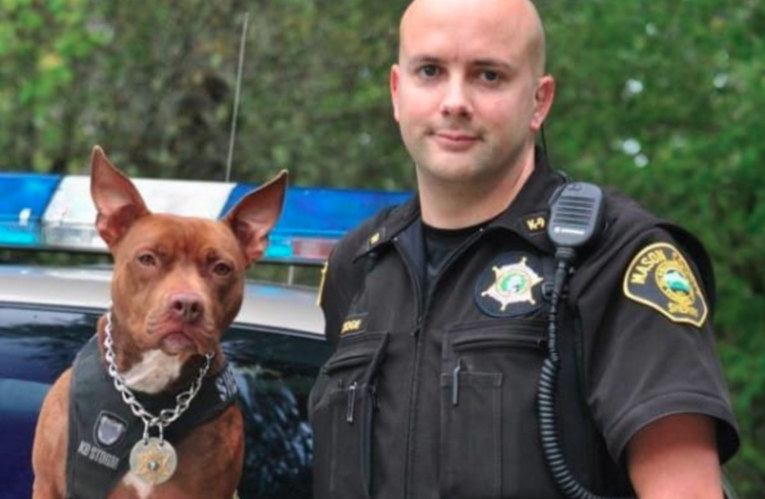 If you are thankful for these officers for bringing in these pit bulls, SHARE this post!